Ever wondered how an object becomes part of the Queensland Museum collection? Queensland Museum Senior Curator, Mark Clayton writes about a toy car that was recently donated to the Museum and sheds some light on the accession process. The Queensland Museum is calling on the public to become involved in preserving the stories within the State Collection. Through the Become a Part of Queensland’s DNA Campaign, people have the opportunity to link their name to an item from the Collection and in essence preserve that story. Queensland Museum, Senior Curator, Mark Clayton has written about his favourite item, an Airmail Bag. The notion of a regular public airline service would have seemed fanciful in the nineteenth century. For Scottish-born Alexander Kennedy however, born in 1837 – just a few months after Queen Victoria’s ascension to the throne – this notion was to be become much more than just a reality. It was ninety-two years ago – this week -that Kennedy (then aged eighty-four) became the first passenger on Queensland’s first scheduled airline service – from Longreach to Cloncurry. Kennedy’s enthusiasm for a local air service had been fuelled two years earlier following a chance meeting in Cloncurry with one of the fledgling airline’s founding Directors. A successful grazier, farmer, councillor, mine owner and company director, Kennedy had agreed to also become a provisional Director and guarantor, in consideration for a seat on the inaugural service. After an uneventful 498km flight with enroute stops for fuel (McKinley) and morning tea (Winton), Queensland’s first airliner landed at 11.30 that same morning, greeted by an equally enthusiastic gathering of Cloncurry citizenry. Kennedy’s first journey there, fifty-three years beforehand, had taken eight months to complete. That airline is still operating, albeit, better known these days for its international services and by its acronym, QANTAS. 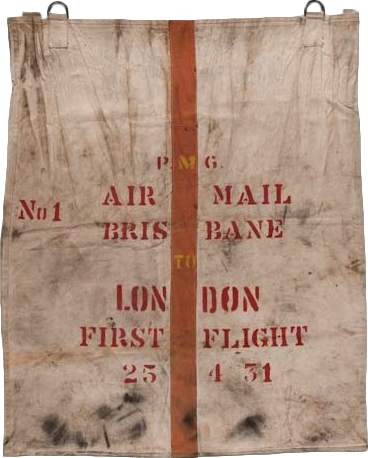 This mail bag was used by QANTAS to transport mail on the very first airmail service between Australia and England in 1931. The airmail bag shown here relates to the following decade, a time when Q.A.N.T.A.S. (Queensland and Northern Territory Aerial Services Pty Ltd), as it was then known, was manoeuvring – desperately – to become something more than just a local air service. All the world’s airlines were dependent then on government mail subsidies, and the Q.A.N.T.A.S. Board was quick to recognise the strategic, financial and prestige advantage of extending its network to include Brisbane and Darwin. The former was the conduit to Sydney and Melbourne, while the latter was the gateway linking Australia with the rest of the world. The Queensland-airline’s opportunity for metamorphosis came on April Fool’s Day 1932 when the British Post Office announced that it would be undertaking an experimental round-trip airmail service from London to Sydney, as an extension of Imperial Airways’ existing London to Delhi service. Although at that time Q.A.N.T.A.S.’s fleet of single-engined aircraft were incapable of providing over-water international services, the company was engaged to fly the trans-continental return sector from Brisbane to Darwin. This is one of the mail bags carried aboard the DH61 Apollo on that successful north-bound proving flight, pilot Russell Tapp’s four-day return flight covering 6,437kms. It was this experiment which led – in part – to the formation two years later of a new international carrier known as Qantas Empire Airways Ltd. This item part of the Queensland DNA campaign and is available for you to take care of. To take care of this part of Queensland’s DNA click here. Hudson Fysh, Qantas Rising (1965), p.92.